I look at painter’s drop cloths like some people look at great fabric. Because it is! Drop cloths are strong and have a great “hand”. They are weighty and work fantastically as slipcovers, book covers, and table linens. I’m working on a project I’ll share next week and wanted to use drop cloths but in a lighter color. No problem! I bleached them. I LOVE the results. 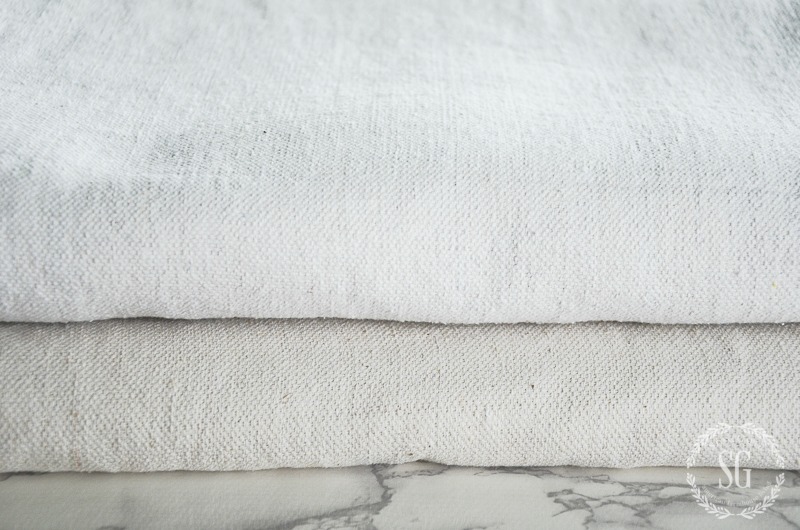 Here’s how easy it is to bleach drop cloths! I bought four 9 x 12 drop cloths for my project. Bleaching them resulted in a softer, lighter color! 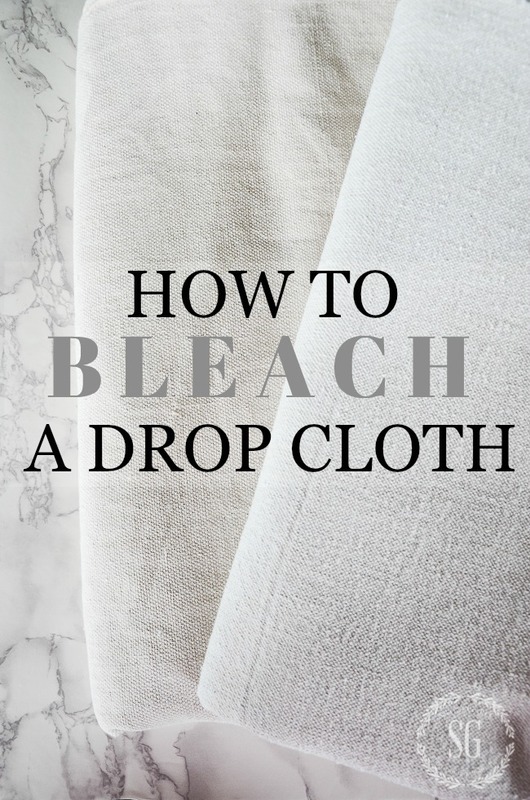 How light a drop cloth will get will depend on the amount of bleach you use the length of time the dropcloths soaks in the bleach and water solution. Add bleach to your washer and let the tub fill with hot water on a regular cycle. When it has sufficiently filled, add in one drop cloth. Let the washer “wash” for about 3-5 minutes . This will distribute the bleach and water evenly around the drop cloth. Then pause the washer. Soak the drop cloth for 3-4 hours. Let the washer finish its cycle. Wash the drop cloth with detergent again. Dry in the dryer. If it still smells like bleach you can wash and dry it again. The more you wash and dry the drop cloth the softer it will get. if you have a front load washer without a “soak” cycle like I do, you can read how to soak clothes HERE. the bleached drop cloths have softer and a little nubbier feel. Really nice!!!! I wanted a very light drop cloth but not white so I used 4 cups of bleach and soaked my drop cloths for 4 hours each. They came out soft and a very light bone color. Which will work with my project at hand. I hope you give this easy project a try! Today on Decorating Tips and Tricks we are talking about STAIRS! How to paint them, cover them, highlight them. What kinds of banisters and balusters and spindles are out there for us to use. We have lots of ideas and info for you today. Don’t overlook your stairs! How do I bleach a drop cloth if I don’t have a top loader washer? I bleach mine in my front load. I make sure the water is in and so is the bleach and agitated a bit and then I pause my machine. Hope this helps. 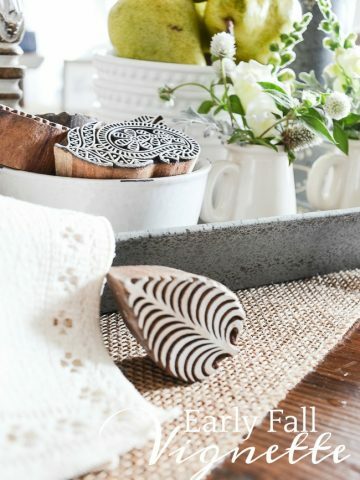 Love your table runner!!! 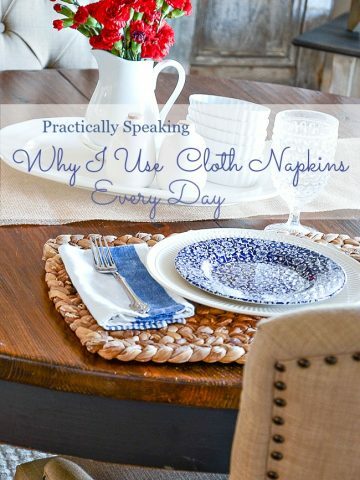 Also love the placemats that you show with your napkins! Did you make them? I think I will attempt to make some “rag placemats” like those before I attempt a rug. Fun! I have several rooms of drop-cloth curtains. I loved working with the fabric and there are so many ways to personalize them for each room to make them your own custom design – paint, dye, etc. I do make my table runner often, but not placemats. What is your opinion on making drop cloth panel curtains? Hi Denise, I love them for a casual look! Not so great. ?. I purchased a 9by 12. Canvas drop cloth at Walmart. There was what I thought was a seam down the middle. I tore the cloth in two and followed the directions for each. One piece was a bit smaller and came out OK the larger piece came out blotchy. Now they don’t match. Should I try the process again? Disappointed. It might be your washing machine. Sounds like the bleach was not distributed evenly in the water. Try filling the tub first and adding the bleach then adding in the dropcloths. Have you or any of your readers ever dyed a drop cloth? I want to make a slipcover for a slipper chair but want a soft pale blue but sturdy fabric. I thought if I bleached the cover first to get it as close to white as I can, I could then dye it with Rit liquid dye. The cost for cloth and dye would be less than $20! Thanks for the tips! Give it a try and report back to us! Hi Yovonne. LOL! No just kidding! Yvonne, I’m not understanding in the link how to bleach the drop cloths in a front loading washing machine. Could you please explain? I’m planning to do slipcovers for several pieces of furniture and think this would be the most economical way to go. Could you let me know your experience? Let me know if you think it would be better just to buy yardage of fabric. Do you think the quality of the drop cloths is comparable to twill or cotton duck that you would buy from the fabric store? Love the podcasts. They truly make my day. Hi Rachel, I think for a cheap heavy and good quality material you cannot beat dropcloths. Duck and canvas are more refined but not as heavy duty. To bleach dropcloths in a front load washer without a “soak” cycle make sure the dropcloth goes through a good deal of the first cleaning cycle, stop the machine and every hour or so start it to let the dropcloth get repositioned. Do this several time and then turn on your machine and let it finish the whole cycle. Does this make more sense? Hope this helps! I just tried this with a drop cloth I bought at Home Depot. It came out quite gray in color. Where did you purchase your drop cloths? Thank you and btw I love your decor ideas and share your love of white dishes! I got my drop cloth from Lowe’s. Maybe you need to use a more concentrated Clorox solution. Welcome to the StoneGable family, Christine! That is an awesome idea! I had ordered 35 yards of cream canvas fabric to make slipcovers out of, but I ordered it a month and a half ago and it still hasn’t shipped! I am going to cancel the order and buy dropcloths instead. Thanks for such a great idea! Thank you! Off to Home Depot! LOL. I do machine embroidery. I can see pillows made out of drop clothes. Aprons and so much more. Fun project. Because my front loader adds the bleach during the rinse cycle, I put the 4 cups into the drum and put detergent in the filler drawer. Then I put the dropcloth in and turned the machine on and ran it a few minutes and proceeded as Yvonne directs. I was stymied because a front loader has to weigh the load before water will go in. It appears to have worked! It’s closer to white than the other one. Probably could have put both 6 × 9’s in one load. I have a front load washer, so can’t fill it with water. What are my options for getting this great look? See how bleached mine in my front loading washer. Can you do this in a front loader washer? I had a slip cover made for my sofa, its great when you have pets (1dog and a cat) !! Thank you so much for this! 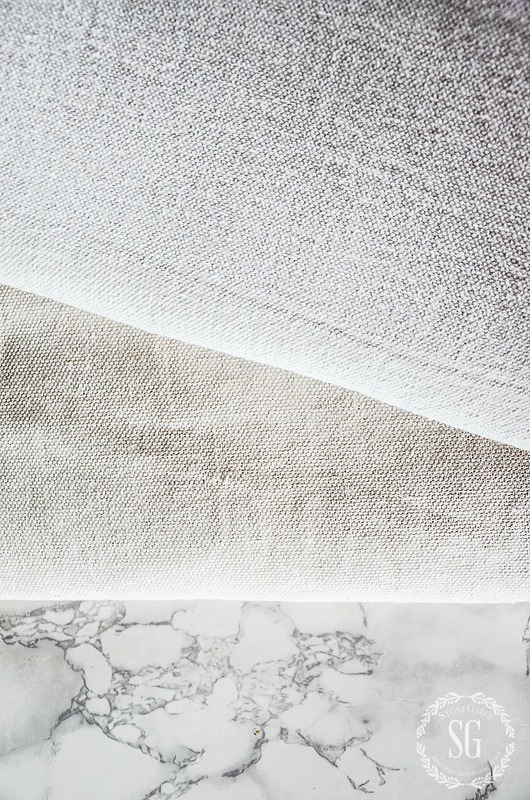 I’ve been wanting to use dropcloths to reupholster 2 living room chairs because I love the weight, texture, and feel of them but wanted something lighter in color and thought about bleaching but just haven’t given it a try … yet. I can’t wait to give it a go! Thanks for the inspiration! Bleaching drop cloths sounds like my next project at my house! Thank you SO much for sharing how to do this. I’ve been wanting to make slipcovers for my dining chairs forever. This is exactly the inspiration I needed…thank you!! I bought one drop cloth to start and am going to bleach it today. Can hardly wait to see what you do with your cloth!! Thanks for the tutorial! I think I want to use drop cloths and redo the window covering in my living room/temporary dining room/piano room – still don’t really know what room it is! Can’t wait to see how you finish yours up. With the bleach treatment, do you think it would be possible to paint a stencil design on the cloth? I’m thinking more of a white on white design. Thanks for posting this! I just bought drop cloths to use as drapes for my covered porch and they would look so much better bleached. Great idea! I need some light colored tablecloths! LOVE YOUR BLOG! I use them as drapes for my outside canopy. I will try washing them that way for now on. Thanks for this! How would you go about getting a white one? Hi Jennifer, Use 8 cups of bleach and soak the drop cloths for 3-4 hours. Hope this helps. I have used drop cloths for table runners, lamp shade covers ,pillow covers, napkins, whatever I can think of to use them for. Haven’t bleached them first, don’t usually use liquid bleach so bleach wasn’t handy for that. We live a ways from stores so when I get urge to make things just go with what I have. Sure appreciate your how-to bleach drop cloths post, will try that soon. We just have old style washer so one drop cloth is all it will take. Was thinking might hang out on windy day, will have lot less wrinkles that way. Hang my sheets out, not one wrinkle in sheets or pillow cases or clothes when hung out. Where we live is almost always windy so mostly hang laundry out as long into Fall and after Winter as I can. Love that fresh outside fragrance and it saves on utilities. Can hardly wait to make bedroom curtains. Thank you so much for this tip! I had slipcovers made for a love seat a few years ago, but I would love to use the fabric for some other projects. I am looking forward to your project reveal! I’m one of those who loves drop cloths. I like the weight, the texture, and bleached, I like the color. Thanks for the tutorial on washing DCs. Looking forward to next week. 🙂 Always excited when you have a new post! What timing! I bought a beautiful white matelasse bed cover from a consignment shop and need a light bed skirt. Can’t wait to give this a try. I’ve used drop cloths for years as decor..and, never thought to bleach them. Btw..happy birthday..I don’t post often..but read all the time. Wow!! !This is incredible. Why didn’t I think of this? 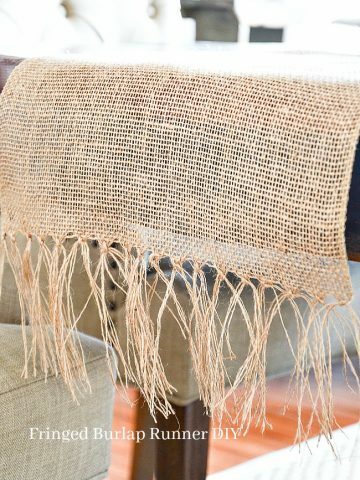 I love drop cloths and used one to cover an old wicker sofa on my screened porch. So far so good with the humidity but I will redo in time if they begin looking ratty. Also I have a top load HE washer and whenever I want to soak items, I merely bucket some water with bleach to fill enough water for a soak. Maybe a little old fashioned but accomplishes my need and barely takes any time. Anxious for the project! Thanks for the expectation ? Looking forward to your project. Totally love the bleached look! Need some drapes for my guest room and this will be perfect. I have been playing with watercolor painting on small pieces of cotton fabric, wonder if it will work on bleached drop cloth? If I have any scraps I’ll find out! Thanks for the link to the front-loading information. Have you tried it yet for the HE washers? I was confused by the instructions on the link. i see new curtains in my future!! i really like the lighter bleached color! Do you wash the drop cloth first and then bleach it while it is still wet? Thanks! Hi Kelly, don’t wash them first. Just put them in right out of the packaging. This post reinforces my suggestion that a friend use drop cloths for sun-blocking drapes on a very exposed patio area. I think they might work better outside if not bleached. The bleached look is quite pretty, though. Love it! I have a top load washer with a special place to add bleach. So you’re saying don’t use that and add the bleach in the drum? Also, my lid locks and I can’t open it once it’s running. I’ve got to figure this out. I have a chair I would love to recover with bleached drop cloths. Thanks for the info. So happy I found you!! I have told my sister and sister in law about you!! I can’t wait to try this and many of your suggestions. 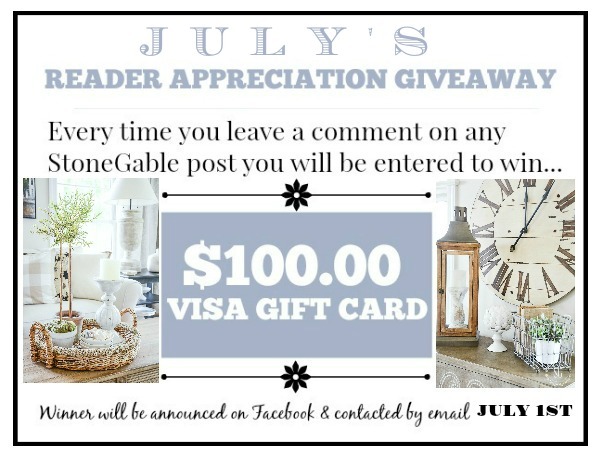 ❤️ Judy B.
Hi Judy, Welcome to the StoneGable family! Thanks for spreading the word about StoneGable. I covered dining chairs using drop cloths and loved the results! This is great! I can’t wait to see what you’re working on. I have a project in mind for bleached drop cloths as well and your tips will ensure that I get the fabric right. THANK YOU! You’re the best. Thanks ! IVE wondered about this because I like them lighter and you can’t find them . Awesome idea to bleach them! Can’t wait to see what your project is. I want drapes for my sunporch and don’t want to put a lot of money in SUN RESISTENT fabrics. I think drop cloths will meet our needs and the color will be perfect. Can’t wait to see your surprise! I know that you said you used 4 cups of bleach but, was that for EACH dropcloth? Or in total? Thanks……looking forward to your next posting! 4 cups for EACH drop cloth. Hope this helps. I have my great grandmother’s settee which is now covered in a green embossed fabric that is faded and in somewhat poor condition. I’ve looked at linen and other fabrics similar to what’s on the settee and they are frightfully expensive. Do you think a drop cloth would work? I AM DYING!!! I can’t wait to see what you have in store for us!!! The new HE washing machine will not let me stop it for a soak without it totally draining the water. I am in a love, hate relationship with this machine. And it is a top of the line model. Will just try several cycles to see how it goes. I also have an HE washer too and the instructions on the link for front loaders as confusing. It says to purchase powder bleach. Have you tried it yet? Did you soak for 4 hours? Let me know how yours turned out. I’m confused on the instructions. I saw your reply on ironing the drop cloth, however I have another question. Will you iron it damp or will you just use a steam iron? I have washed a cloth before and never have seen so many wrinkles. I surely must have done something wrong. Thanks!! I can’t wait to see what you have planned for your bleached drop cloth fabric. Have you ever tried dying a drop cloth, like blue or some color? I was wondering if it would be best to bleach the drop cloth and then dye it. I had a love seat upholstered with a drop cloth, and my upholsterer said it was her favorite fabric EVER. Go figure. The love seat looks as if it is covered with a french linen. Love it. Bet it also saved you a lot of $$$ on fabric. Love this idea. I can’t wait to see what you did with the drop cloths! Thanks again for another I-wonder-what-would happen-if-I tried-to-[fill in the blank] episode! When our new farmhouse door with venting side lites is installed, we will have a grand farmhouse look with lots of light, but then also we will have a big fishbowl effect with loss of privacy. Plan to hang floor to ceiling curtains that can be drawn, but so far that would be cost prohibitive. Think that dropcloths will do the trick! Simply amazing! Can’t wait to see your project you are working on! I have never used dropcloths, but I do like their look. Can’t wait to see your project! Don’t you just hate auto correct? That should be “your” project and “and” run out! I know. But I’m such a horrid speller and proofreader I probably would not have noticed! Can’t wait to see you’re finished project. Have to run out band get some drop cloths! I love using drop cloths! Very reasonably priced. May I ask what size drop cloths do you buy? I looked on line and there are several sizes and some are heavy duty? Thanks so much. The size I use depends on the project. For this project, I used 12 x 9 drop cloths. I don’t often use heavy duty. Droy cloths are pretty heavy anyway. Many bloggers also use them as indoor curtains! Great idea! I just looked on line and there are so many different sizes and thicknesses. Is there a best choice for curtains? Can’t wait to see your project. What great tips Yvonne. I am hosting my niece’s bridal shower (couples) and we are going with a fixer upper theme since they just bought an older home. I’d love to bleach one to use as a tablecloth. What a great theme for a bridal shower! So fun. I’m waiting for my invite! Thanks for the tip! I’ve been trying to find the time to use these for outdoor curtains. You’re the best! They should make fabulous outdoor curtains! Thanks for the how too’s. can’t wait to see what you made!!!! Sorry, I got distracted and didn’t read down far enough. I should have known that you would not leave that out. I thoroughly enjoy your posts and look forward to them daily. I see a chair project coming soon. Have a Blessed day. can you tell us approximately how much bleach you used for your drop cloth? Hi Rita. Look in the post. Info in there. Thanks for the information on bleaching dropcloths. I’m actually going to slipcover a loveseat I have in my living room and will definitely use bleach to lighten it up. Can’t wait for your drop cloth project reveal! Love drop cloths but being a non-seamstress , have never worked with them. Ideas not requiring sewing appreciated and welcome!!!! I have a great no-sew project for you next week! What a teaser! Can’t wait to see your project. Your drop clothes came out to be a really pretty color. I could see turning them into a tablecloth. I have no idea what you’re planning on using these for…but one question comes to mind. Are these drop clothes going to require ironing? Just the thoughts of ironing them brings dread, but I do like the weight of a drop cloth. As the saga continues…I can’t wait…the anticipation will drive me crazy, just like that book with the tutorial on an apron hanger! Melissa, I am going to lightly iron the drop cloths. But they will be easy to do. Great idea! Can’t wait to see these put to use! I’m looking forward to seeing what you do with these! You’ve got me thinking about drop cloths now! I love using them! Great natural colored and bleached. This is a project I will have to try. I am guessing a front loading washer would work fine. You always have clever ideas for us! Pinned it so other gals who don’t subscribe can see it (and your fabulous blog!). Thanks for pinning, Donna! I LOVE MY PINNERS! Can’t wait to see what you are up to next, Yvonne! Have a great day. Where do u buy your drop Cloths? I get them at Lowes or Home Depot. Any hardware or paint store should carry them. oh my, thank you for this post. I’m wanting to use drop cloths as curtains in my bedroom and think this process will soften them up a bit to hang better. I can’t wait to buy my drop cloths this weekend and proceed with your process to get these hung in my bedroom. Thanks, Lisa! I’m using my bleached curtains for that project too! But don’t tell! Now, I can’t wait to see what the project is with the bleached drop cloths!